James will be consuming as much of NZ Theatre Month as he can. New Zealand theatre history can be divided into two distinct periods: Before Roger Hall (BRH) and After Roger Hall (ARH). 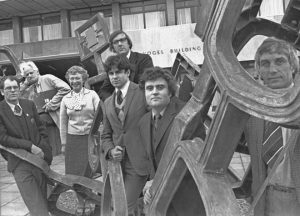 In the year 0 ARH (that’s 1976 in our usual calendar), Roger Hall’s Glide Time – a close to home satire of the Wellington public service – debuted and was a smash hit for Circa Theatre. Roger Hall’s play (together with Joseph Musaphia’s Mothers and Fathers the previous year), marked a distinct turning point in the commercial acceptance of home grown theatre. New Zealanders were laughing at “themselves” and could now “support local drama without any sense of ‘cultural cringe’”. (1) Ian Gordon wrote about his experience watching Glide Time for the first time with “an audience delighted to see themselves on the stage, recognising that Roger had them to a T, and responding delightedly to every line”. (2) Hall’s plays arrived at a time when New Zealand was reformulating its conception of itself following Britain officially joining the European Economic – his work was characterised as a distinctly new, popular and representative type of local play, dramatizing a uniquely New Zealand point of view. That is not to say that theatre began in 0 ARH. In the years before Roger Hall this country had a creatively rich (if not always financially lucrative) range of theatrical activity. From the late 40s literary figures like Allen Curnow, James K Baxter and Frank Sargeson were experimenting with theatre. Stella Jones had her play The Tree (1957) produced in the UK and subsequently toured across the North Island. Bruce Mason was writing epic state-of-the nation plays, but ended up going the DIY route with his solo tours of The End of the Golden Weather. Robert Lord had his plays produced in the early 70s before leaving for America. Meanwhile, now legendary alternative collectivist companies like Amamus, the Living Theatre, Theatre Action and Red Mole were taking politically charged work to the people. But New Zealand theatre was never the same again post-Hall. Hall became our most commercially successful playwright. His Footrot Flats: The Musical (1983, with collaborators A.K. Grant and Philip Norman) was a smash on both sides of the Tasman (and has clocked up 150 productions according to the author). Middle Age Spread (1977) was performed in London’s West End in 1979 starring Richard Briers and Paul Eddington. Hall’s plays, reflecting a particularly Pākehā sensibility, have been a sure bet with companies and societies across the country and across the decades. Auckland Theatre Company most recently produced Last Legs in 2017. In 2015 Hall became the first playwright to be recognised in the Prime Minister’s literary awards. Hall’s mainstream populism has seen him unfairly maligned by some critics – his dramatic body of work represents a substantial cultural history over more than four decades. If we needed any further proof that this view is long dead, Playmarket, New Zealand’s playwright’s agency, recently released an analysis of the programming by our professional theatres in 2017 (producing houses, receiving houses and producing companies funded by Creative NZ under the Tōtara and Kahikatea models). Playmarket found that companies and audiences love local work: of the 221 staged productions, 79% were New Zealand works. Playmarket’s breakdown gives a picture of the representation on our stages: 14% were Māori works, 11% were Pasifika, 7% were Asian works, and 48% were works by NZ Women. Although this data gives only a snapshot of a particular year, the overall trends are notable (while using different data, it can be contrasted to CNZ’s earlier finding that between 2011 and 2015 only 6% of productions by main centre theatres were of Māori or Pasifika work). What better time then for the inaugural New Zealand Theatre Month? Sure, it doesn’t look like our professional companies need any encouragement to programme local work – they are committed to telling local stories. But having a month for theatre provides an opportunity to harness everything that is going on. When companies are focussed on surviving from show to show, there can be little opportunity for telling a national story as an industry. New Zealand theatre makers produce high quality and truly remarkable work – it is exactly the right time to celebrate this. Roger Hall and Malcom Calder have instigated the month to “celebrate and elevate” Aotearoa’s theatre. The goal is to run New Zealand theatre month in Septembers over the next five years. The New Zealand Month website currently features 120 events being held this September including productions, readings and talks – from professional to community and everything in between. Auckland features 40 events. Wellington has 24. Canterbury has 23. Otago has 16. Waikato has 9. Bay of Plenty has 6. The Marlborough & Nelson region has 5. Taranaki has 4, as does the Manawatu & Whanganui region. Hawkes Bay has 5. We can also see which areas are under-served in theatre: Southland has 2 events, Northland and Gisborne both have 1. So far there are no lisitings for the West Coast. Roger Hall is well represented – there are productions of Four Flat Whites in Italy in Fielding, Middle Age Spread in Blenheim and Hastings, and The Book Club on Waiheke Island. Bruce Mason’s final play, The Blood of the Lamb, is being performed by Dunedin’s Globe Theatre. There are three productions that feature Katherine Mansfield (The Case of Katherine Mansfield, Modern Girls in Bed, Bloomsbury Women and the Wild Colonial Girl) Dean Parker, another playwright with a long career, has his latest play Wonderful at BATS. Alison Quigan’s Mum’s Choir is at The Court Theatre. Last Tape’s Valerie returns from its Edinburgh Fringe triumph (where it won a prestigious Fringe First award) to perform in Dunedin. Pacific Underground are presenting a reading of Oscar Kightley’s and Simon Small’s landmark play Fresh off the Boat at the Court Theatre. Indian Ink’s Mrs Krishnan’s Party and Red Leap’s Kororāreka – The Ballad of Maggie Flynn are touring across the country. Women in Theatre will place wāhine the centre of the frame, with plays such as Modern Girls in Bed, Medusa, Kororāreka, Orientation, Mrs Krishnan’s Party, Promise & Promiscuity, Sightings, Valerie, Jane Doe and Mum’s Choir all either focusing on women’s stories or being shaped by female creatives. Generational will focus on showcasing the shifting forms of what defines a theatre show. From top shelf text-based theatre from cherished playwrights such as Carl Nixon, Oscar Kightley and Alison Quigan to the inter-disciplinary work of contemporary theatre makers like Nisha Madhan, Chye-Ling Huang and Benjamin Henson, this theme covers the changing face of theatre in contemporary New Zealand. NZ Theatre Month begins in Auckland with a tribute to Bruce Mason at his namesake theatre on September 1st. The month will then be officially launched at parliament by Associate Minister for Arts Culture and Heritage Hon Grant Robertson on Monday 3 September. New Zealand Theatre Month is an exciting initiative for the industry and theatre going public. It is remarkable scrolling through the website and appreciating the breadth of what is produced around the country. It helps us to see theatre beyond company or regional silos, but as a greater whole. Wouldn’t it be amazing to have a website running all year where you could see, at a glance, what is happening around the country? New Zealand Theatre Month doesn’t make a distinction between professional and community – it recognises that both contribute to the strength and benefits of theatrical participation in this country. And while the professional statistics for local work are healthy, it also empowers community theatres to proudly programme local work during the month. New Zealand theatre month is a chance for audiences to seek out work. While there is an abundance of work produced, finding the audience is a perpetual challenge. During a Radio NZ interview for NZ Theatre Month, featuring playwrights Hall, Thomas Sainsbury and Renee Liang, Sainsbury called for a cultural shift: “if it’s got comedy festival around it, people will go. If it it’s got Roger Hall attached to it, I think people will go. And then each production launches its own battle to get audiences along.” Liang argued however that different audience groups were being developed for theatre – everything is diversifying. A theatre month allows us to consider the way that we value theatre in Aotearoa, seeing it as a core part of our society and culture. In 2017 CNZ found that 80% of New Zealanders had either attended an arts event, or participated in the arts, in the previous 12 months. Is that reflected in our national conversations and media? 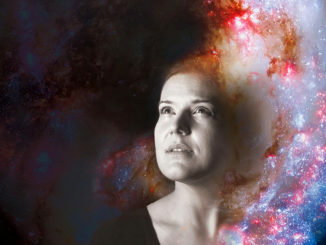 New Zealand Theatre Month is one avenue we can articulate what is already happening, and further help grow attendance by connecting curious audiences with productions (while also being conscious of accessibility and the barriers that prevent this). New Zealand Theatre Month is also an excellent opportunity to learn more about our history – both BRH and ARH. To better understand the journeys of theatre in this nation. For young practitioners and older practitioners to connect with each other. To take another look at our dramatic canon. For all these reasons, this is why Theatre Scenes is supporting New Zealand Theatre Month with extended coverage through September. I (James) will be seeing as much theatre as I can get to (even beyond Auckland), and writing about everything I see. While we have incredible theatre offered year-round, by focussing on this particular month’s offerings I want to take the pulse of our theatre. Through a series of blogs I’ll discuss what I’m seeing and ask: What does Aotearoa New Zealand Theatre look in 2018? What are we thinking about? Concerned about? Dreaming about? What kind of country and society is being reflected back to us through the dramatic mirror? 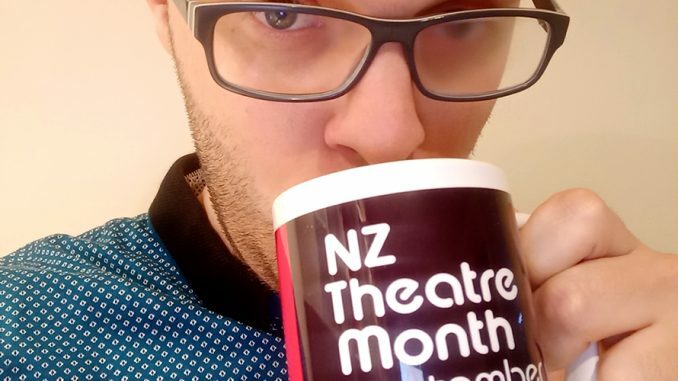 Join me as we explore the theatre scene over New Zealand Theatre Month. Browse their website and plan your calendar now. Stuart Hoar has two of his plays (about time!) being produced during the month: Bright Star, about little known NZ cosmologist Beatrice Hill Tinsley, and Rendered, a military thriller. Albert Belz’s newest work Cradle Song – a supernatural horror – is debuting at Te Pou theatre’s new home at Corban Estate Arts Centre before coming to Q Theatre. 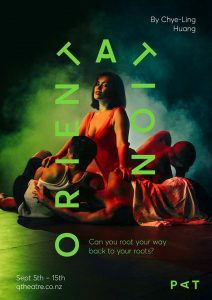 Chye-Ling Huang’s Orientation, presented as part of Q’s Matchbox series, promises to lift the sheets on sexual stereotyping. Uther Dean’s newest play Me and My Sister Tell Each Other Everything plays at the Basement Theatre. Thanks for that James – I have posted a teaser and link on Theatreview.